Evgeny Malkin renewed an eight-year contract with the Pittsburgh Penguins. We recall the highlights of one of the world's best hockey players, from the junior Championship in Belarus to the NHL. Evgeny Malkin, one of the best hockey players in the world, has renewed his contract with the NHL’s Pittsburgh Penguins for an eight year term. RBTH recalls five highlights from Malkin’s career. The first time Evgeny Malkin proved his star potential was at the 2004 World U18 Championship, which was held in Belarus’ capital of Minsk. The Russian junior players beat the Americans, 3-2, and the young Malkin became one of the top scorers of Team Russia, with 4 goals and 4 assists. View the video: Malkin gets into his second fight of the playoffs in a match against Boston. Even so, the Urals hockey school graduate might never have risen to stardom: In the run-up to the tournament, the forward suffered a severe head injury during a match for the Magnitogorsk Metallurg farm club. “Right until the last minute, we were not sure whether Malkin was coming to the World Championship. Eventually, we decided to risk it and bring him over. And even though Evgeny was not in top shape, he was named MVP of the tournament,” says Andrei Shayanov, who coached the Russian junior team at the time. Malkin’s transfer to the NHL was marred by a high-profile scandal. In 2004, the Metallurg forward was picked second overall in the NHL Draft by the Pittsburgh Penguins. He was expected to start playing in the NHL in the fall of 2006. Metallurg’s managers prolonged Malkin’s contract until 2008, however, despite his willingness to move overseas. In protest, Malkin left the team camp in Finland, without authorization, and headed for the United States, where he started preparing for the NHL season. The Russian side tried to bring the player back, but, on Sept. 5, Malkin closed a deal with the Pens. The center debuted for his new club in an exhibition game against Philadelphia. Malkin registered an assist in the first period, but he injured his back in the second, following a collision with his teammate John LeClair. In 2009, Malkin had an extremely good season. He topped the scoring table in the regular season by securing 113 points, helping his team finish fifth overall. In the playoff finals, the Penguins faced the Detroit Red Wings, just as they had the year before – and this time they won in a tight, 7-game series. Apart from winning the Stanley Cup, Malkin became the first Russian to receive a Conn Smythe Trophy, which is awarded to the most valuable player in the NHL playoffs. In 2012, Malkin became a true leader of the Penguins. In the absence of Sidney Crosby, who was disqualified for 60 games, Malkin secured his team a playoff berth by recording 108 points in the regular season. This achievement is all the more impressive since Malkin missed most of the 2010/2011 season: He sustained a serious knee injury and had to undergo a tough recovery in the preseason. May 2012 was the heyday of Malkin’s career on the national ice hockey team. Evgeny twice fell one step short of a World Championship title – in 2005 and in 2010. In 2012, Team Russia, staffed with the likes of Pavel Datsyuk, Semyon Varlamov and Alexander Ovechkin, swept away the competition by winning every single game of the tournament. 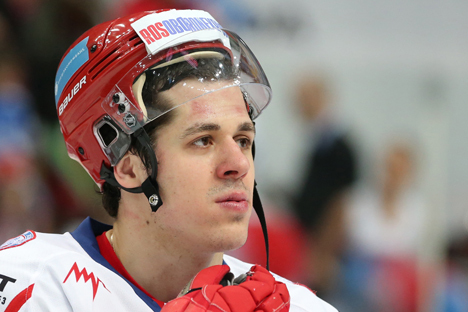 In the final match, Russia stunned the Slovaks, 6-2, and Malkin became MVP of the Championship.